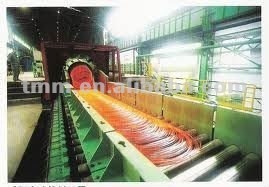 Our company has sucessfully co-manufactured experience with Mannessman Demag Sack Company, SMS company, Germany and Morgan Construction Company, U.S.A and supplied many sets of high speed wire rod mill, roughing mill, intermediate mill and cooling bed to many famous companies and plants of China and oversea countries. High speed wire rod rolling mill and finishing mill with rolling speed from 36m/s to 120m/s can turn billets with cross section areas of 150 x 150 mm into wire rod with diameters of 5.5 - 14 mm. Its annual output can reach 200000 - 800000 tons. Various specifications of Roughing Mill, Intermediate Rolling Mill, Pre-Finishing mill, finISHING Mill and Laying Head could be designed and manufactured.